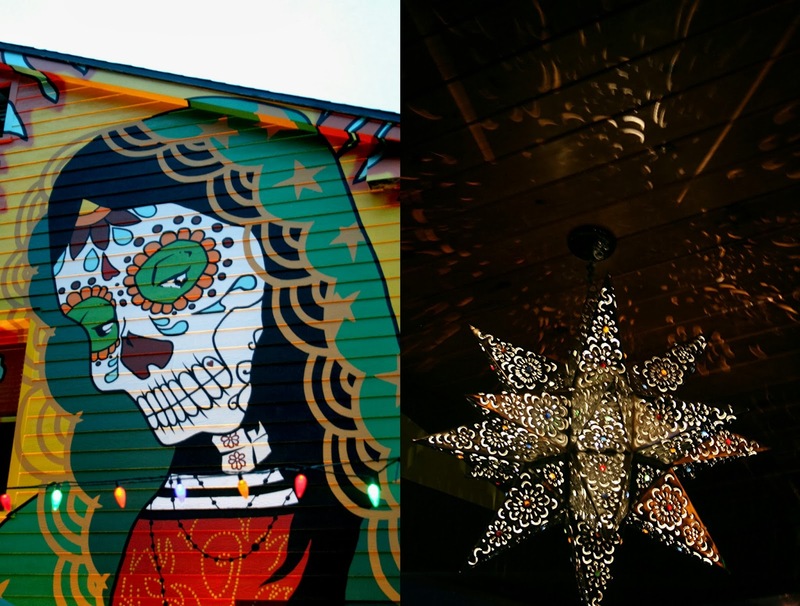 As you can see, TacoLu doesn't sport your average restaurant decor, there are bright murals, day of the dead skulls, crazy cool lanterns, and other Mexican inspired paraphernalia as far as the eye can see. There is also a pretty suave bar/lounge area outside which would have been cool if it wasn't 95 degrees outside. When we finally got seated, we had no choice but to order come classic chips, guac, and salsa (partly because it sounded good, and partly because we were starving). The chips were your average corn tortilla variety, the gauc was tasty and made fresh to order (I liked that they garnished it with roasted pepitas), and the salsa was, for me, perfect. It was the ideal balance of sweet and spicy and it wasn't too watery, but it didn't have an excessive amount of chunks either. 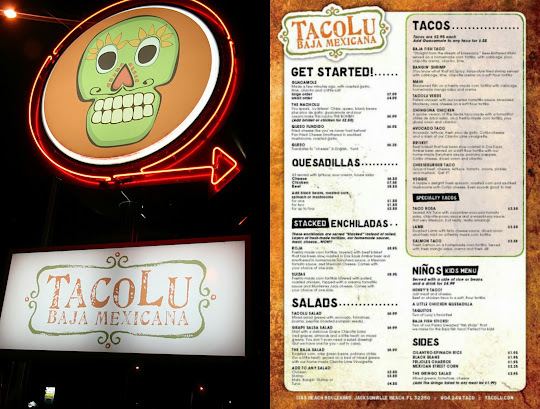 Lewis ordered the TacoLu verde which was pulled chicken with roasted tomatillo salsa and Monterey Jack cheese, he also added on the cheeseburger taco which included your typical ground beef, cheese, lettuce, tomato, onions, pickles and mustard. The chicken verde was a big hit, but the cheeseburger one (which is the one that most closely resembles a regular taco) was lacking in the flavor department. The added side of beans and rice was a nice treat, they were seasoned well and were as good as beans and rice could be. I ordered the banging tempeh taco along with the grilled scallop taco, which had Blackened Scallops on Cabbage with a slice of Avocado, chipotle crema and a splash of cilantro-lime vinaigrette. I was disappointed with the tempeh taco, especially since our waitress raved about it, I am not sure what it was but the seasoning reminded my of wet dog food...yeah, not a pretty picture. The scallop taco, however, was probably in the top 3 best tacos I have ever consumed! They gave you four large scallops, seasoned to perfection and perfectly complimented by the cool creamy crunch of the slaw. Next time I come back, it's gonna be double scallop tacos for me! The Verdict: While I am not quite sure yet if TacoLu lived up to the hype (and two hour long table wait) I would say that all in all it's a pretty cool place. The atmosphere is festive and unique much like the food they serve. It's definitely worth a trip - just make sure you make it there before 6.